So often we associate the word “imported” with luxury. Wine from Italy, sheets from France; it’s practically become a contest to see whose belongings are more exotic. Yet when it comes to fruits and veggies, the best produce is grown close to home. Mainstream grocery stores often ship their fruit and vegetables from distant places, and harmful pesticides are widespread. But fear not, Bostonians; the city is ripe with farmers’ markets almost every day of the week. And why not patronize our local businesses? The produce you purchase at farmers’ markets is the freshest possible; chances are it just came out of the ground. And in a time when big businesses shut down the mom-and-pop stores we love so dearly, independent farmers truly need our support. They are reliant on the individual purchases of people like us in order to survive. 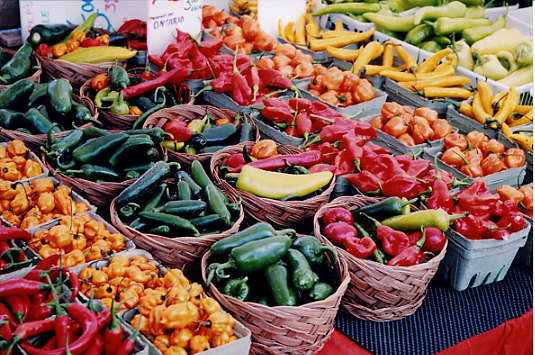 With prices at grocery stores like Whole Foods sky-high, farmers’ markets are known to be the ultimate bargain. And now that multiple Boston farmers’ markets are accepting WIC coupons, food stamps, and a variety of other discounts, fresh produce can be an option for all Bostonians. So pack a jumbo-sized tote bag, because we’ve compiled a list of some of the best local markets Boston has to offer. Allston: Harvard University runs this market at the corner of North Harvard Street and Western Ave every Friday from 3 to 7pm. The farmers are on hand to discuss recipes and food preparation, which brings the concept of eating locally to a whole new level. Dorchester: With Dorchester becoming one of Boston’s most popular neighborhoods, it’s only natural that there be a farmers’ market on the scene. The Ashmont/Peabody Square Farmers’ Market opens July 10th, so head up to Dorchester Avenue for some fresh produce every Friday from 3 to 7pm. Copley Square: Operating since mid-May, The Copley Square Farmers’ Market has a prime location close to the Prudential Center and Newbury Street. Extending far beyond the traditional carrots and cukes, you’ll find fresh breads, bath and body products, and even biscotti. It runs every Tuesday and Friday from 11 to 6pm. SOWA/South End: An area of town famous for its nationally-recognized restaurants, the South End provides everything from boutique shopping to art galleries. Head to SoWa, or south of Washington Street, on Sundays when a slew of farmers flock to Harrison Ave, as well as artists and antique dealers. The hours are 10 to 4pm. Brookline: Coolidge Corner is a culturally diverse yet family friendly atmosphere. Thursdays from 1:30 to to 8pm you can find the typical fruits and veggies, but also home-baked pies and specialty meats. Central Square: When it comes to up and coming neighborhoods, Central Square is at the top of the line. This Cambridge hotspot offers a diverse array of produce, but also baked goods and cheeses. Charles Square: If it’s all about location, Charles Square runs the show. The best farmers’ market in the Harvard ‘hood, Fridays from 12 to 6pm are the perfect time to escape from work a little early and pick up the freshest produce you can find. South Station: If your daily commute finds you waiting for a commuter train at South Station, don’t hesitate to stop by the Boston Public Farmers’ Market on Tuesdays and Thursdays from 11:30 to 6pm. There is no arguing that farmers’ markets are best place to shop if you want the freshest produce possible. But there’s many other reasons to support your local farms. In the same way Wal-Mart takes down the independent businesses we grew up with, the small, family-run farms are disappearing as we speak due to financial troubles. We have to support the people who put their hearts and souls into the ground each season, so consider doing so with a trip to your local farmers’ market. A contributor to DirectoryofBoston.com, Megan Johnson is originally from Connecticut, but has lived in Boston since age 18. She is a frequent contributor to Boston MenuPages, Reinventing Beauty Magazine, Butterfly Diary, and SweetTalk on the Spot. You can visit her website at www.meganjohnson.tumblr.com.